If spring has put you in the mood for a musical, Northern Stage has a cheerful, polished production of The Spitfire Grill for you. The staging is fine, though the story is piffle — expect only the whipped cream of dessert, not a full meal. Still, these empty calories go down easy. In the musical version, the story is slow starting and never settles on a central arc. Percy, a young woman just released from prison, picks a small Wisconsin town in which to start her new life. Sheriff Joe, her parole officer, helps her get a job as a waitress at the local café. It's owned by salt-of-the-earth widow Hannah, whose husband died soon after their son was reported MIA in the Vietnam War. The tiny town's residents include stiff-necked Caleb, who misses the work he had at the now-closed quarry and wants his wife to be content with housekeeping. Alas, that wife, Shelby, is happier waitressing at the café alongside Percy. Stitching the town together with gossip is postmistress Effy, a café regular. The pot gets its first stir when the close-knit community has to decide whether to accept Percy, the interloper. It's not much of a dilemma. Though Percy needs cooking lessons, she's perfectly capable of keeping the café humming when Hannah is laid up with a broken leg. So, with no galvanizing event, the story just skips to the point where Percy becomes Hannah's trusted surrogate, Shelby's you-go-girl pal, Caleb's bête noire and Joe's love interest. Really? That all happened because she served plates of fried eggs? Well, of course, Percy served them while everyone was singing. The central distraction of musicals is essential, since The Spitfire Grill can't muster conflict or fully developed characters. The closest we come to a problem is Hannah's desire to sell the café. The local market has yielded no takers, so Percy and Shelby figure it's best to give it away as a national contest prize. Send in an essay on why you'd be the best new owner, include a $100 entry fee and, if your essay is chosen, the place is yours. Oh, and it would be best if you live in a metropolis, you nurse a fantasy — based on utter ignorance of rural America — that your life would be better in a small town, and you tend to think and speak in clichés. Winner! The premise yields a deluge of letters extolling nonurban life that swamps the weary locals into realizing how good they have it. Mind you, only one of them was itching to leave, but Joe is now in love with Percy, so he doesn't need the essays to convince him to stay. And dang if the best essay isn't ... well, we need not spoil the maudlin ending. Perhaps sensing that this wasn't much of an engine to keep a whole musical running, Valcq and Alley give several characters tragic backstories. We'll leave these as the surprises the authors intended them to be, but past events do not constitute onstage drama. This kind of storytelling relies on accumulating facts to "explain" characters, which cheats the audience of discovering them and robs the characters of human complexity. This is Spitfire's grave weakness. Costumes by Johanna Cahill and Meghan Pearson give each character a clear style, and the lighting by David M. Upton establishes a great variety of moods. The nicely realized set, designed by Jordan Janota, blends solid realism in the café's detailed particulars with stylized woods outside, capped by a gorgeous moon on the sweeping background scrim. The venerable Briggs Opera House offers a wide stage vista, yet it's an intimate space. That's why the decision to give the performers microphones backfires. Not only would their voices have carried sans amplification, but they paradoxically would have had more presence without it — presence that makes live theater exciting. Instead, we're treated to the Briggs' fine speaker system, which adds artificiality to performances that are so proximate. When a character turns upstage and her voice never seems to move, for example, a virtue of the playing space is squandered. Director Catherine Doherty keeps the pace lively, and the actors engage with each other so fully that the production has great warmth. Doherty stages the solos with very limited movement, presumably to keep the focus on the vocals. This is fine for showcasing the contemplative songs, but there are moments when more movement might better suit the storytelling. The show kicks off with Percy's arrival, for instance, and showing the energy of her plan for a new life seems to demand motion, not an inert solo. Some of the big production numbers are charming, though, and make it easy to lean back and let the pure pleasure of a musical blot out any deficiencies. As Percy, Amanda Ryan Paige serves up a lush torte, alternating no-nonsense bluntness with sweet layers of adorable. Susann Fletcher handles the script's big clichés with conviction, and is careful to keep Hannah's heart of gold set on "stun," not "annihilate." Marisa Devetta brings a fine soprano to the role of Shelby, and gives her feminist evolution as much subtlety as the script allows. When the three of them get together, they're enchanting gal pals. As grim Caleb, Ben Sargent trudges through a role that Valcq and Alley failed to make either villainous or engaging. 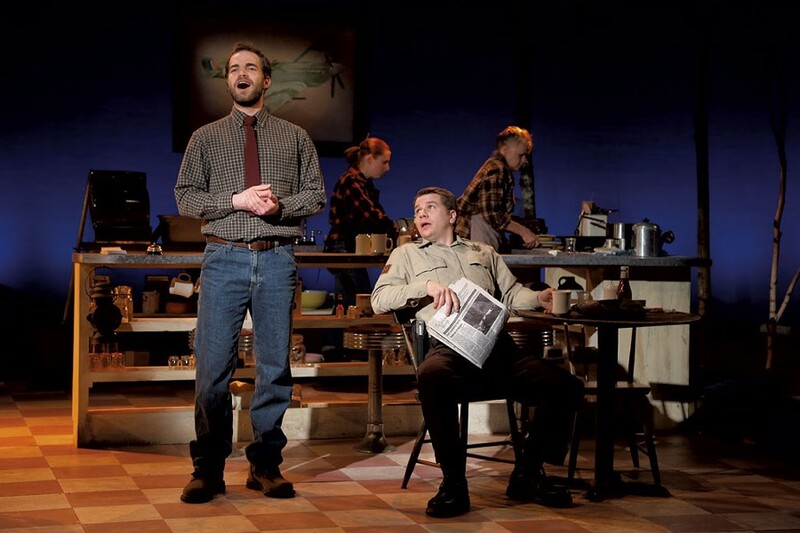 Kevin David Thomas, as Joe, has true Broadway pipes and presentation, and moves smoothly from gruff to puppy-eyed. The scene-stealing Charis Leos plays Effy with a comic's precise timing. Music director Joel Mercier leads a five-man live band. They're hidden behind the scrim and also miked, so the instruments have the same nondirectional quality as the vocals. Even so, the music itself is a good reason to see the show. Mercier's inventive arrangements blend country/folk guitar and violin with pensive cello and keyboard accents. The show's authors can't muster more than clichés to try to capture what's idyllic about small-town life. The Northern Stage cast can't redeem those flaws, but it can entertain us all the same.